Students from Blessed Trinity being interviewed live on CP24. Six o’clock in the morning isn’t usually when you would expect the parking lot of an elementary school to be bustling with activity. 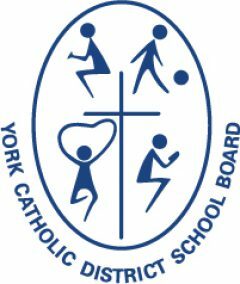 However, on the morning of Monday, November 19, Blessed Trinity Catholic Elementary School in Maple was perhaps the liveliest place in all of York Region. 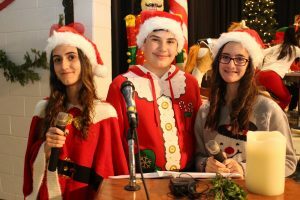 It was selected as the school to launch the CP24 CHUM Christmas Wish, which is supported by the City of Vaughan’s annual toy drive. “I was ecstatic!” said grade 8 student Adrian Carcone when asked about getting to take part. A former national speech finalist, he was one of three students who hosted the early morning event in English, French and Italian respectively. The event had particularly special meaning for Carcone whose family has been supporting the CP24 CHUM Christmas Wish through the City of Vaughan for 20 years. For Blessed Trinity Principal Anna Maria Di Giammarino, the chance to host the event was a clear message to her community: “It’s an awesome opportunity to give back to the GTA,” she said. “We are able to live out our faith, pay it forward with the gift of giving.” Donning a Santa hat, she and her staff had for weeks been preparing over 200 students for the event, which took place in the school’s gymnasium. Broadcast live on CP24 Breakfast, students shared a wide range of their talents on-air, including singing Christmas carols, dancing and even showcasing 21st century learning in a Santa’s STEM Lab, using techniques such as 3D printing. Present to help launch the toy drive were Vaughan Mayor Maurizio Bevilacqua, who formally launched the campaign, councilors from the City of Vaughan, Trustee Teresa Ciaravella, YCDSB Director of Education Ab Falconi and Associate Director Frances Bagley along with Superintendent Mary Battista, who all took time to meet with students and their parents over the course of the morning. To learn more about the CP24 CHUM Christmas Wish or to donate please visit the campaign’s official website.